This is the final project in Alberto Cairoâ€™s 3D class I took in 2006. 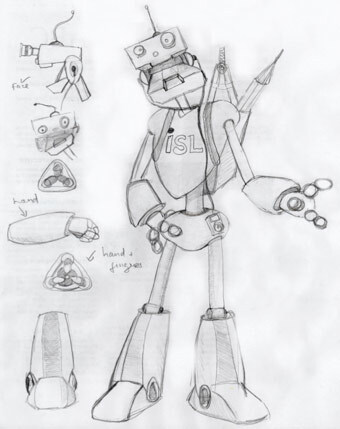 The assignment was to design a character that would also serve like a logo for Institution of Science Learning (ISL). The ISL was a project sponsored by the biology department at UNC-Chapel Hill. It was responsible for creating highly interactive software with multimedia that help teach biology to high school students. I wanted to create a robot character. I knew that it could be very cheesy, but I did it anyway. After doing a couple of sketches, I came up with something I liked. I named my robot eDeot. It took me about one night to model and texture the character. I still remember how I started around midnight and finished right before it was due in the next morning. I was pretty happy about how the project turned out. 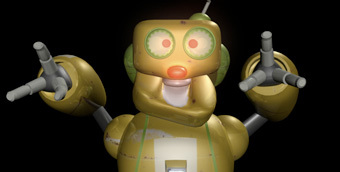 While creating the character guide, I think managed to give the robot a distinct character.